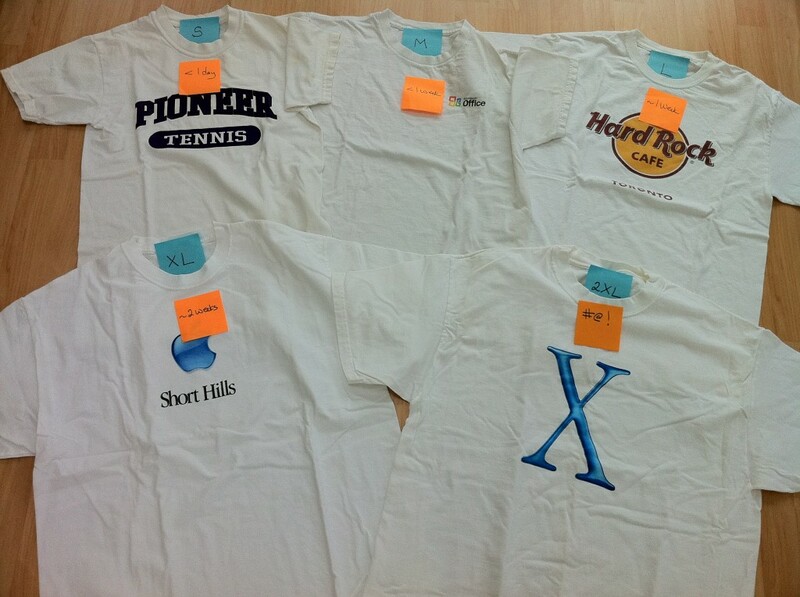 What do t-shirts have to do with story point estimating you ask? Plenty! Working with organizations transitioning to agile I often find that estimating is one of the first areas of discomfort, and story point estimating is just too hard to grok for most. After all, most developers have been giving estimates based on time for most of their careers, and we come along and ask them to think of relative points for estimating. It often goes over like a lead balloon. To ease the transition I use physical aids. T-shirts to be exact. 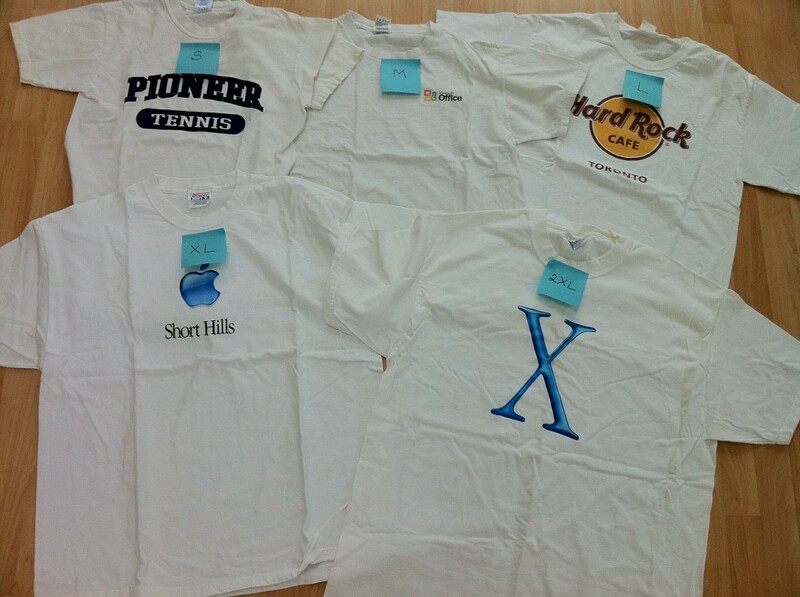 Raiding my closet for shirts of various sizes, I bring them out on estimating day and lay them on the table in front of us. Remember, this initial story sizing happens to gauge the general size of the effort to help product owners with sprint planning. Sizes range from Small, Medium, Large, XL, and XXL. For the small, I ask the team to consider the smallest amount of work that could be accomplished in one Sprint. Don’t fret over breaking down the story into parts, that comes later in Sprint planning. Just consider the work required to complete this one piece of functionality and that gets an estimate of small. Next consider work that is larger than small, but not quite considered large. Then medium to large, etc. It’s a relative comparison between each sizing. With the other sizes in plain view, the team can make mental comparisons between the work required from a small to an XXL. Each sizing from small to XL represent stories that can be completed in one sprint. The stories for XXL, well, they’re just too large to effectively estimate. I tell them to consider these the major pieces that need attention by the BA or product owner to break down. As the team gets used to the relative sizing, I’ll ask them what they are considering for the small – is this like a one day effort? What does the medium feel like – less than a week? This is a transition activity, and I’ve found that a nice give-and-take discussion around the sizing helps us move along. With a little visual aid the teams quickly move on to estimating the work using the relative sizing concept. Not to mention they have a lot of fun calling out ‘medium’ or ‘large’ rather than abstract story point numbers. Now, if you’re a project manager or scrum master that needs to project a schedule of relative effort in terms of time, and management does not want to wait for a couple of sprints to pass so you can measure velocity, you have the option of producing a rough (I emphasize rough), straw-man schedule based on these t-shirt sizes. For this I’ll take the feedback from the team on the relative sizing. If they said small was less than a day’s effort, and medium was less than a week’s effort, then that’s what I’ll use in translating the relative estimates to a project duration projection. In this case you’ll see the XXL t-shirt is not translated into any size since this was un-estimatable in its current form. The teams I’ve worked with had a much better time estimating from sizes with the rough translation into time than just straight story point estimates or time estimates on the stories. 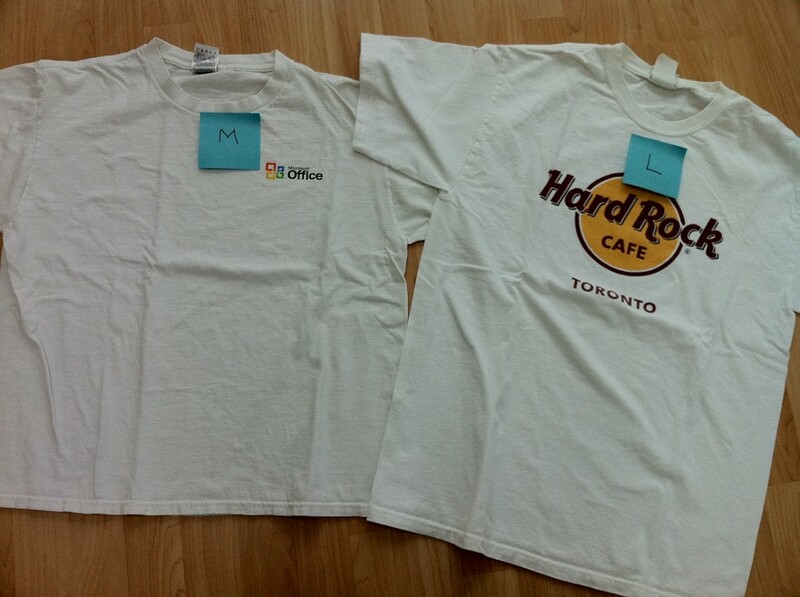 As I left a client site and took my shirts with me, I observed the existing project manager gather up t-shirts to continue to use with the teams for estimating. Here’s wishing your good ideas carry on as well! Sarah Hoerauf, Product Manager at HealthMedia, Inc.